For a few months now, we’ve wanted to start making our own kombucha tea after learning about the process and how easy it is from our friends Allison and Vernon. With a couple of 32-ounce clamp-top bottles costing $3.50 at IKEA, it’s nice to know how to make it at home. It’s not hard at all! The benefit to drinking kombucha is the probiotics that help your digestive system, and a lot of people simply drink it because they like the taste. It’s hard to describe, but the taste reminds me of dry champagne. Dave first introduced me to kombucha, and I think he came across it by chance when he grabbed a bottle of it at the check out from a grocery store. He loved it, and has been drinking the store variety for a while now. Store-bought kombucha can be too strong for my taste, but when you make it at home, you get to adjust it to suit your preference. The Kombucha Culture, sometimes mistakenly referred to as a mushroom, is a Symbiotic Colony Of Bacteria and Yeasts (the friendly type) and is sometimes called a SCOBY. Kombucha is a popular health promoting beverage and natural folk remedy. The Kombucha culture looks like an off-white rubbery pancake. The culture is placed in sugar sweetened black or green tea and allowed to ferment for about 8-12 days while it turns the tea into a sea of health-giving acids and nutrients. The kombucha culture feeds on the sugar and, in exchange, produces other valuable substances which change into the drink: glucuronic acid, glucon acid, lactic acid, vitamins, amino acids, antibiotic substances, and other products. The kombucha culture is, therefore, a real tiny biochemical factory. Numerous improvements have been noted in overall health, including: increased energy, sharper eyesight, better skin condition, and improved ‘eliminations’ to name a few. (The list is really long and somewhat anecdotal, but personal experience is the best gauge for how it makes you feel). The daily use of controlled amounts of Kombucha Tea, along with improved diet (particularly increased water intake), can help to deal with a variety of ailments, and/or help to maintain good health. Kombucha is a valuable supplement to health care. Numerous doctors and scientists have concerned themselves with the effects of the Kombucha beverage as a home remedy. Many scientific works are at hand concerning Kombucha. They speak of its therapeutic effectiveness as based on glucon-acid, glucuron-acid, lactic acid, acetic acid, as well as the life-supporting vitamins C and the B-group. As has been proven especially by Russian researchers, many of its components have antibiotic and detoxifying characteristics, and they play a decisive role for the biochemical processes in the body. In contrast to many pharmacological preparations with unpleasant side effects, the active substances of the Kombucha address themselves to the whole body system; through its friendly metabolistic properties, it can reestablish a normal condition in the cellular membranes without any side-effects and thus promote one’s well-being. Wooden or plastic utensils for handling the Kombucha Culture. You must avoid contact with metal containers/objects, in regards to care/storage of fermented tea and the cultures themselves. Excessive use (especially if you have not been consuming many fermented foods/drinks) might cause some physical discomfort until your body adjusts. Kombucha reproduces itself, and if properly maintained, you could have/make a lifetime supply from a single Kombucha Culture. Q: What is a SCOBY and where do you get one? A: SCOBY stands for Symbiotic Culture of Bacteria and Yeast. It’s what transforms the sweetened tea into kombucha and provides the healthy probiotics. You can receive one from a friend who makes kombucha like we were gifted with ours from Vern and Allison, you can order one through the mail, or you can experiment with growing one from a bottle of store-bought kombucha tea. Here is our SCOBY at the left, but if you want to see what others look like, do a quick Google pictures search. 1.) 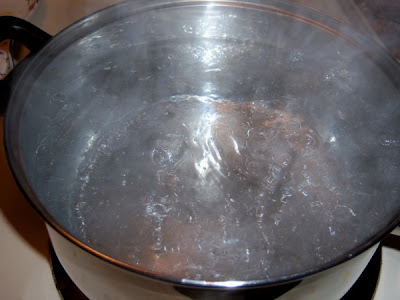 Boil 4 quarts of filtered water. Filtered is very important as chlorine can harm the SCOBY. If you can’t access a Brita (or better) water filter, then let your water sit out over night to let the chlorine evaporate. 2.) Remove from heat. 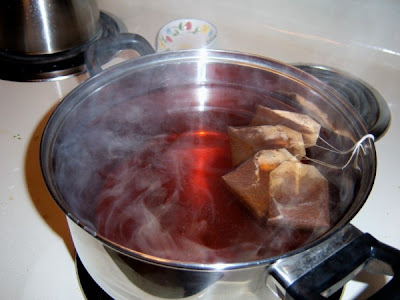 Add 4 tea bags and let steep for 20 minutes. 3.) 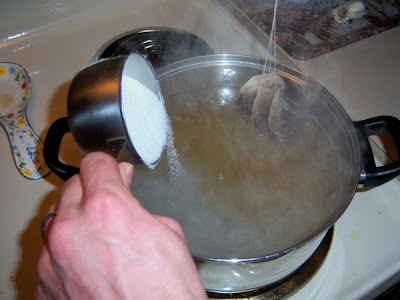 Remove tea bags. Stir in 1 cup of sugar and let cool. 4.) Pour room temperature tea into glass bowl and add the SCOBY and 1/2 cup of kombucha from the last batch as a starter. It is important to have some active yeast from the last batch added to get the process moving. 5.) Cover bowl with a tea towel. We put two strips of tape on the towel so it doesn’t droop into the tea. Since it’s winter, we’re not too concerned about securing the towel down, but in the spring and summer, when fruit flies are a plenty, you’ll want to secure it around the bowl with a rubber band or string. Or you can ferment the kombucha in a large canning jar instead of a bowl and use the canning jar ring to lock the edges of the towel down and keep the flies out. 6.) Let it sit undisturbed in a dark place for about 8-12 days (we keep ours on top of the fridge). The longer it sits, the less sweet it will be as more of the sugar gets consumed. You can sample it with a straw to see how long you want to wait. Q: Refined sugar is not part of the Maximized Living Nutrition Plans. I know it’s best to avoid refined sugar. Can I use a natural alternative like honey instead? A: From what I’ve read, the SCOBY does best with sugar in the most simple form possible. Almost all of the sugar will be consumed before you drink the kombucha. The SCOBY eats the sugar and turns it into the acids that are good for us. You can make it with honey, but it’s harder to perfect, and honey costs way more. With our budget, we’ll be sticking with cheap white sugar. 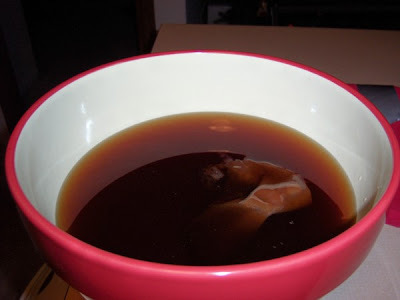 Remove the SCOBY from the jar and clean it with your fingers in distilled white vinegar. Brush away any sediments from the SCOBY and make sure no mold growth is apparent. Reserve a half cup of kombucha to start the next batch. Place in a small clean glass jar for storing. 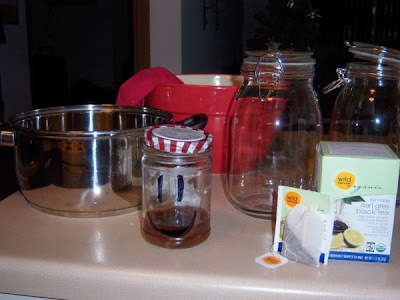 Add the clean SCOBY to the jar, seal, and place in the fridge until you are ready to make your next batch. Pour the kombucha into locking jars. We’re using glass locking jars with rubber seals that we got from IKEA. You can find similar at Whole Foods, bottling or brewing stores, and possibly even Walmart in their canning section. A batch this size fills three 32-oz bottles. Add flavoring if you like, then seal the jars. Some of the tastiest ones we have made are ginger lemon, strawberry banana, grape, and mint. Let the bottles sit in a dark place at room temperature for at least 7 days. This improves the flavor and adds carbonation. After 7 days, transfer the bottles to the refrigerator. They’re ready to drink and taste best cold! Q: I’m not sure if my SCOBY looks right. How would I know if it’s contaminated? A: Try searching Google for photos to compare. 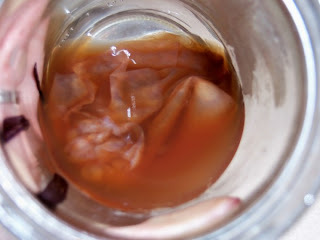 If your SCOBY has brown tendrils on it, that’s probably just extra yeast, and you can remove those. 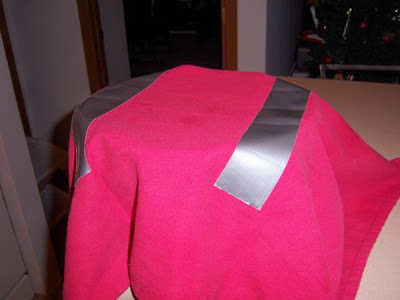 If you think your SCOBY has mold on it, be safe and start over. How do we make the Kombucha tea if we don’t have a 1/2 cup left from the last batch? Can you explain how we get started without it? or how to get it? I’m LOVING your website. I’ve been maximizing my little family for a year and a half and it’s awesome to find new exciting recipes. We’re thrilled! We’re also enjoying having your husband, Dave around. I just had the opportunity to spend Friday afternoon with him. He’s a great guy. You two make an awesome team… he’s so proud of you! Hi Sandra! I’m so happy you’ve met Dave and are plugged into M.L.! That’s fabulous! And so glad my recipes are helping you. That is my goal, to help all of us M.L.ers to enjoy eating and make it easy. I love your website and Facebook page. Thanks for the inspiration! Can you use Xylitol for Kombucha? Hi! Glad you are enjoying my work and getting healthier in the kitchen from it! Xylitol will not work for making kombucha. The SCOBY bacteria feeds off of sugar to make more good bacteria (the kombucha). You can use white sugar or honey. Don’t worry, the SCOBY eats up all of the sugar, so kombucha is Advanced Plan approved!